EXODUS – IS IT MORE THAN A MYTH? 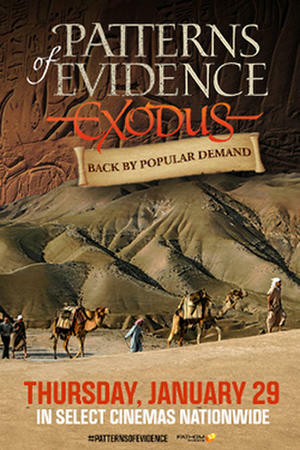 With investigative-style narration, Patterns of Evidence: The Exodus takes modern documentaries to a cinematic and epic level, featuring an amazing soundtrack and stunning visuals. Inviting us on a journey, filmmaker Timothy Mahoney propels the audience through 12 years of personal research and discovery as he wrestles with a question posed to us by the experts of our day: Did the Exodus really happen or is it simply a myth of Biblical proportions? Believer and skeptic alike are bound to appreciate the way Mahoney gives equal opportunity and respect to the varying and even contradictory views of the archaeologists and Egyptologists he interviews. Rather than focusing solely on the religious and historic implications, Mahoney treats his subject in a scientific manner, approaching it with difficult questions and allowing the evidence to speak for itself. Lending his voice to the stellar production, Kevin Sorbo, (Hercules) approaches the narration with warmth and deep conviction. Though the talents of Sorbo have been greatly overlooked by Hollywood, due to his political and religious beliefs, his presence in so many independent films lately has been a real treat. As I watched this masterpiece with my daughter on the night of the premiere, I found it to be both inspiring and intriguing, with evidence so strongly in support of the Biblical account, I wondered how an intellectually honest person could deny it. Line upon line, Mahoney uncovers the misconception of archaeologists en masse regarding the dates for the Exodus occurring during the time of Rameses II (c.1250 B.C.) and the subsequent dismissal of the Biblical account due to the lack of evidence during this time period. From there, the film proceeds to expose no objective evidence for presupposing the touted date, as it clearly unravels about 6 lines of evidence which all indicate an earlier date of c.1450 B.C. I couldn’t help but smile when the audience literally gasped in amazement as the patterns of evidence were uncovered, the timeline was “fixed”, and the points on it clearly matched the Biblical account of Exodus. Judging by the reaction of my daughter and our fellow moviegoers, the favorite evidence unearthed was that of the palatial tomb in Avaris. The discovery of this pyramid shaped structure revealed the statue of a foreigner in Egypt; one who wielded great power and wore a multi-colored coat. In keeping with the story of the Patriarch Joseph, the tomb contained absolutely NO bones, just as recorded in Exodus 13:19. Coincidence? Maybe. Maybe not. Sitting in the packed theater, I couldn’t help but anticipate the release of the Genesis Movie, currently being created by our team at Creation Today. If you enjoyed Exodus, make sure you come back for another treat when we bring you the true account of Genesis, this time in stunning 3D animation! Due to overwhelming demand, Fathom Events has confirmed an encore presentation of this film in select theaters nationwide on Thursday, January 29th at 7:00 pm local time. If you didn’t get a chance to see it the first time, make sure you avail yourself of this opportunity!